Eid preparations have been in full force in our home, mainly consisting of never-ending cleaning, but with eye candy, tasty treats and lovely smells being planned. I bought this little oudh/bakhoor holder and a small slab of bakhoor (looks like chocolate! ), can't tell you how lovely this smells. Decorations are all ready for when the kids fall asleep, looking forward to this bit. Spent a little time trying to match my jewellery to my Eid clothes a few days ago, so only had to buy a few new purple bangles for myself today. I thought I would do a little something for my self as well. 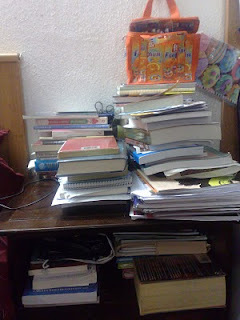 My bedside table has been loaded with creams, heartburn medicine, books, papers, notes and other assorted junk for months. It was nice to clear it and make it a place to pamper myself at bedtime. The box is mostly full of stretch mark creams, various hand lotions and lip balms. This is from my good friend T and is almost too good to use, but will light it tonight I think after all of the days work is done and when I settle down with the girls to get our henna done.